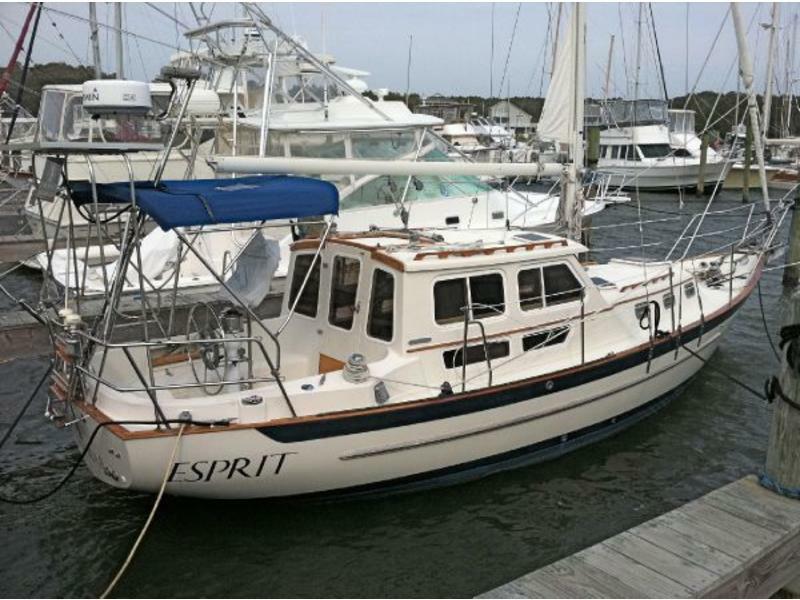 (LOCATION: Beaufort NC) The Pacific Seacraft Pilothouse 32 is the result of a request which came from dealers in northern Europe who wanted an all-weather high-quality pilothouse yacht for the North Sea. Some yachts have pilothouses that seem like afterthoughts or, even worse, look like a condo grafted atop an otherwise pretty boat. This Bill Crealock design is neither, and it was obviously conceived from the beginning by someone who knows the sea as well as yacht design. The 32 Pilothouse is designed to be an all-weather cruiser at home in foul and fair weather, in the North Sea or Caribbean. On deck we have stainless steel bow rail, bow pulpit with dual rollers, two CQR anchors, and new Lewmar electric windlass that can be controlled from either helm. A Hood In-mast mainsail and Hood Seafurl Genoa have lines leading aft for cockpit control. The spacious cockpit features bimini top, dodger, full tent enclosure, cushioned seating, and Edson helm with raised helm seat, full controls, compass, and chart plotter. Auxiliary power is provided by a 43-hp Yanmar diesel engine designed for economy and durability. Cruise Air reverse cycle HVAC maintains interior comfort. For those looking for safe, comfortable, blue water capabilities this Pacific Seacraft 32 Pilothouse provides it all with style. Call now for more information and to schedule a showing of this unique cruiser.